St. Martin's Paperbacks, 9780312580759, 640pp. A major North American hydroelectric dam is blown up and the largest off-shore oil field in this hemisphere is destroyed in a brutal, coordinated terrorist attack. But there was one factor that the terrorists didn't take into account when they struck the Capitana platform off the coast of Colombia—slaughtering much of the crew and blowing up the platform—and that was the Capitana crew chief Dewey Andreas. Dewey, former Army Ranger and Delta, survives the attack, rescuing as many of his men as possible. But the battle has just begun. While the intelligence and law enforcement agencies scramble to untangle these events and find the people responsible, the mysterious figure of Alexander Fortuna—an agent embedded into the highest levels of American society and business—sets into play the second stage of these long-planned attacks. The only fly in the ointment is Dewey Andreas—who is using all his long-dormant skills to fight his way off the platform, then out of Colombia and back to the U.S., following the trail of terrorists and operatives sent to stop him. 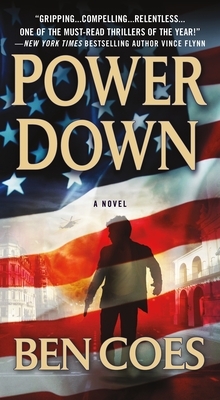 Power Down is a gripping, compelling debut thriller from a powerful new author, an amazing talent certain to join the ranks of the genre's finest writers. BEN COES is the author of the critically acclaimed Power Down and Coup d’Etat. He is a former speechwriter for the George H .W. Bush White House, worked for Boone Pickens, was a fellow at the JFK School of Government at Harvard, a campaign manager for Mitt Romney’s run for governor in 2002, and is currently a partner in a private equity company out of Boston. He lives in Wellesley, Mass.